The Mirage is a 3,044 room hotel and is connected by a free tram to Treasure Island. The marquee in front of the Mirage is the largest free standing marquee in the world. The hotel opened in November 1989 as first megaresort in Las Vegas. Casino: Yes. Casino games include Blackjack, Craps, Roulette, Baccarat, Pai Gow, Pai Gow Poker, Let It Ride, Caribbean Stud Poker, Poker, Keno, 2,245 slot machines including Megabucks and Super Megabucks. The casino has a poker room. Race & Sports Book: Yes, a 269-seat race and sports book, equipped with 29 televisions and 10 big screens. 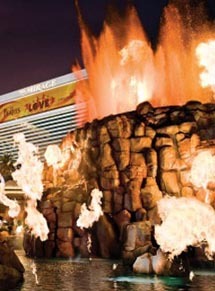 Restaurants: The Mirage has the following dining options: B.B. King Blues Club, Blizz Frozen Yogurt, BLT Burger, STACK, Fin, Kokomo’s, Samba Brazilian Steakhouse, Onda, Cravings, California Pizza Kitchen, Japonais, Roasted Bean, Roasted Bean Express, Paradise Café, Carnegie Deli, Dolphins Snacks, Starbucks and a variety of bars and lounges. Entertainment: Entertainment includes: touring headliners and LOVE, a Cirque du Soleil production. Singer, impressionist and ventriloquist Terry Fator performs in his self-titled theater. Guests can also enjoy BB Kings Classic Soul Dinner and Show at B.B. King Blues Club. Nightlife: JET nightclub and the Revolution Lounge. There is also a mojito-inspired bar, Rhumbar, B.B. King’s Blues Club and the King Ink Tattoo Studio and Bar. Attractions: Secret Garden and Dolphin Habitat and Mirage volcano. Pool: Yes, a pool and jacuzzi. During the summer months, the hotel features the pool club, Bare . Health Club or Fitness Equipment: Yes, offering stationary bicycles, treadmills and stair climbers, a full line of CYBEX weight-training machines, free weights, a comfortable lounge and a full-service juice bar. Spa: Yes. The Spa offers a variety of massages, body treatments and facials. The Kim Vo Salon provides specialty hair treatments for both men and women. Shops: OPTICA, The Men’s Shop, Impulse, The Mirage Shop, Watch Boutique, Art of Music, Paradiso, Sugar Factory, Cirque/LOVE Boutique, Kardashian Khaos. Convention Rooms: Yes, more than 170,000 square feet of state-of-the-art meeting space will accommodate groups of five to 5,000. In-Room Internet Access: Yes, all rooms have high-speed internet access for a fee. Parking Garage: Yes, an eight-story parking garage. Standard Room Amenities: Air conditioning, alarm clock, remote-controlled cable TV, hair dryer, desk, electronic door locks, in-room safe, iron and ironing board, on command/pay-per-view movie, radio, telephone, minibar. Incidental Charges: Hotel requires a credit card for incidental charges. There is a resort amenity fee of $20 plus tax per room, per day, which includes daily in-room internet access, daily newspaper available for guest pick-up at the Impulse Store and the bell desk; two robes for guest use during the stay; daily access to cardio room (does not include spa or fitness center); complimentary printing of boarding passes at the business center or concierge; complimentary notary services at the business center; unlimited local and toll-free calls; free copies and faxes (up to the first five pages, excluding color and large print jobs) at the business center.